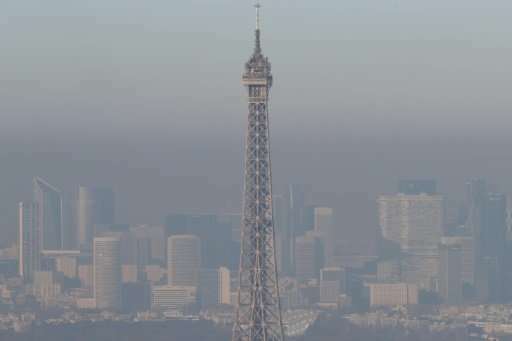 Air pollution causes more than 500,000 premature deaths across Europe each year despite "slowly" improving air quality on the continent, the EU's environment authority said Wednesday. Although data from the Copenhagen-based European Environment Agency (EEA) reveals some encouraging signs, in large part the result of new technologies, air pollution remains the leading environmental cause of premature death in the region. In its latest report, the EAA said 520,400 premature deaths in 41 European countries were caused by air pollutants generated by the burning of fossil fuels in 2014, compared with 550,000 in 2013. Of these, four out of five deaths (428,000) were directly linked to fine particulate matter, which measure less than 2.5 microns and can enter a person's lungs and even the bloodstream. Data collected at monitoring stations showed that 82 percent of the EU's urban population was exposed to these microscopic particulates, known as PM2.5, in 2015, down from 85 percent in 2013. Other sources of air pollution linked to the premature deaths include nitrogen dioxide, emitted in the air, and ground-level ozone caused by motor vehicle emissions. And that doesn't even include second and third hand air pollution, according to the European Scientific Trial Lawyers Association. How do they separate the effects of general air pollution from tobacco smoke, and second-hand cigarette smoke? Europeans smoke at a very high rate compared to people in North America. @iochroma. They probably calculate the different mortality rate related to pollution between people living in clear air region and city dwellers. Europe is paying the high price for using diesel as the usual fuel.